In India, rose water is used as eye drops to clear them. Some people in India also use rose water as spray applied directly to the face for natural fragrance and moisturizer, especially during winters. 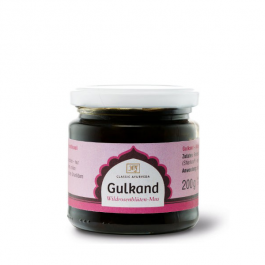 It is also used in Indian sweets and other food preparations (particularly gulab jamun). Rose water is often sprinkled in Indian weddings to welcome guests. “I most commonly recommend products with rosewater or rosehip oil for acne and rosacea prone patients, because it reduces bacteria on skin, decreases inflammation, and simultaneously hydrates and soothes the skin,” says Jessica Weiser, MD, a dermatologist at New York Dermatology Group in New York City. After cleansing, simply dampen a cotton pad with a few drops of the stuff and apply to the face. You’ll notice any redness go down almost instantly, and your nose will be happy, too. So long, pricey, scented micellar waters — there’s a new cleansing water in town, and it goes by the name rose. It’s incredibly effective at whisking away even the harshest of waterproof eye makeup, yet gentle enough that it’ll never irritate the skin or burn the eyes. Plus, any lingering rosewater will keep the skin soft and hydrated. Got dry, dull tresses? 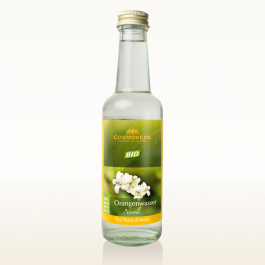 Bring a cup of rosewater into the shower with you and, after shampooing, use it as a final hair rinse. It’ll condition your strands like no other, as well as add a shine that you didn’t know was possible. Another option: “Add rosewater to your shampoo to get soft and refreshed hair,” advises Barry. Be prepared, though: the gorgeous scent will last for hours after, prompting strangers to compliment you all day long. It’s a hard life, eh? We can’t state it enough: Rosewater is a winner at banishing redness and discoloration. Don’t freak if you wake up with puffy bags or dark circles. Simply soak a few cotton pads in the magic juice and apply around your eyes for five minutes. Not only does it feel absolutely amazing, but you’ll look like you somehow managed to get a full eight hours. “Rosewater’s benefits stem from natural anti-inflammatory properties, which make it ideal for topical application to calm red, irritated skin conditions,” says Rachel Nazarian, MD, a dermatologist with Schweiger Dermatology in New York City. If you’re the type that’s riddled with painful irritation after even the most careful of shave sessions, you’ve got to get your hands on some rosewater, stat. Apply it to skin after stepping out of the shower, and you’ll feel instant relief. Bonus: Hours later, you’ll still be soft and silky. 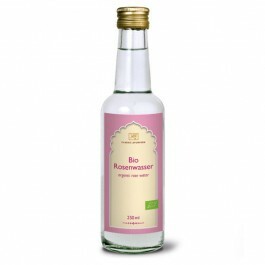 Rosewater has similar calming effects on the mind as it does on skin. “It has many of the same benefits as witch hazel, clary sage, or neroli, easing anxiety, encouraging self-love and release from past pain, and even a little aphrodisiac twist,” says Sarah Villafranco, founder of Osmia Organics. One of the easiest ways to revel in the scent? Add a cup or two to a bath, and make sure to breathe deeply. You’ll feel instantly at ease and, again, you’ll smell delicious for hours. Who doesn’t hate looking in the mirror post-lunch, only to find that the day’s makeup looks dull and cake-y? Add some rosewater to a travel-size spray bottle, and spritz on the face whenever the dreaded moment strikes. Your makeup will be revived, and you’ll even see a lovely new glow, too. Light Fragrance: Intricate perfumes aren’t for everyone, and rosewater is the perfect scent for a fragrance minimalist. Dab on the neck and wrists, and enjoy as peoples’ noses perk up when you step into a room — and not in that, “Whoa, what’s that heavy smell?” kind of way. Don’t let rosewater’s soothing, non-irritating reputation fool you; this baby’s still got a sensual side. Spritz on sheets to refresh between washes. Rose water is a flavoured water made by steeping rose petals in water. It is the hydrosol portion of the distillate of rose petals, a by-product of the production of rose oil for use in perfume. 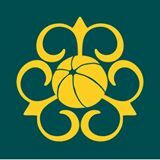 It is used to flavour food, as a component in some cosmetic and medical preparations, and for religious purposes throughout Europe and Asia. Rose water is used to flavour desserts, especially in Arab and Indian cuisine. 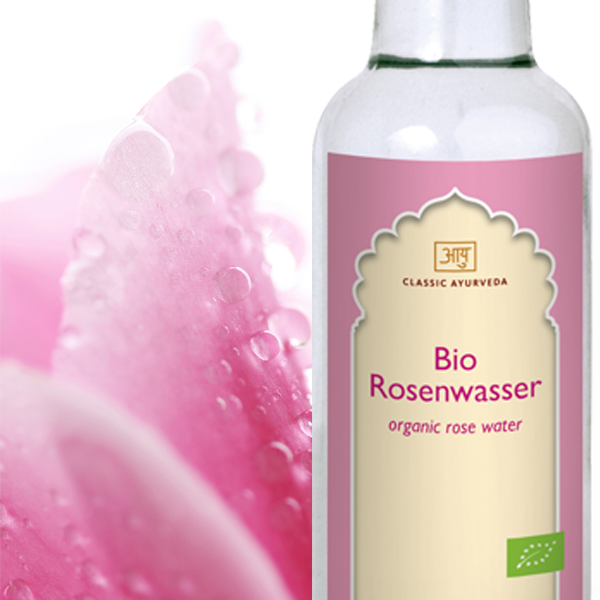 According to Ayurveda, rose water acts by having a cooling and harmonizing effect on the doshas. Add to food or drink to taste, 1 to 2 teaspoons per serving. Allergy advice: Peanut free, gluten free, lactose free , cup nuts free.